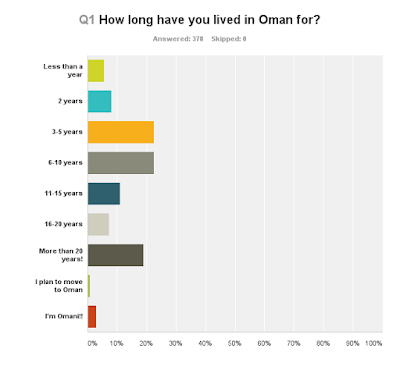 Well, it seems that a lot of you expats have lived in Oman for a really long time. It seems that people tend to stay here for at least 3 years... and would you look at the number that have lived here for more than 20 years? 20% of you! Well that's the new thing I learned today! To live it's a wonderful place, the pace of living a bit slow but plenty of things to see/explore. Only downside is the working climate/conditions that the past 1,5 - 2 years have become less appealing. I forgot to vote on your poll though I fall in the >20 years bracket. So I totally relate to westernized society comment posted by an Anonymous commenter above. I think this "westernization" is at a more micro/socio level (playschools,education, parties, lifestyle businesses) than the country as a whole that still retains its traditional charm and values. bladenomics: I agree... there's places and people who have faux-westernized themselves, and aspects of Muscat, but... the rest of the country and villages... not really... At least not anywhere that I have Omani friends... even the "western" ones still retain a lot of their culture. Unfortunately when you use things like Refriferators, Electricity, AC, Computers, Internet, smart phones, fast food, Hollywood movies, theme parks, pop music, grocery stores, gas stations, etc. you are becoming "westernized". It's tough not to become westernized when many new technologies that people want and need come from the west. The smart phone and internet is the biggest example I think that changed many people.